Lacquer Lockdown: Hot Off The Stamping Press: Pueen Stamping Plate Lover Nail Art Stamping Plates! Hot Off The Stamping Press: Pueen Stamping Plate Lover Nail Art Stamping Plates! How's everyone's weekend? Its already ready Sunday but I'm feeling less resentful about this since its a right before the Thanksgiving holiday - woot! Today I'm going to be showing you some plates that have released recently as I try to catch up with the never ending set of releases that always happen around this time of year! 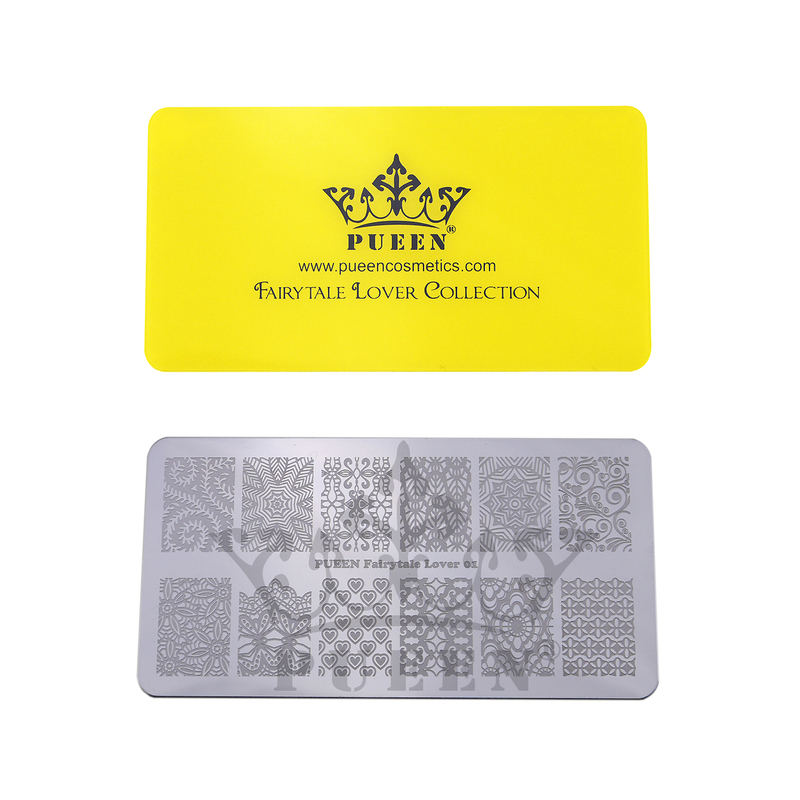 This post is for the new Pueen Cosmetics Stamping Lover Set and plates. This is Pueen's first foray into the rectangular plate game so let's take a look. This is the kit that includes 4 plates each with a different type of "lover" theme. The kit also comes with the Pueen Ultra Soft stamper and scraper. I left a really poor review of this stamper on the Amazon site. I have it is definitely NOT ultra soft. It's a squishy firm stamper on the far end of firm and also incredibly small such that if you have long nails this pad will not accommodate your length, and despite advertising yes this stamper does require priming. One of these days I'll get around to posting the actual review here, but for now just take it as you've been warned. The is the Nature Lover plate. I have to say most of these plates from this releases are fairly unoriginal or novel. Sorry not trying to be mean, but the images are pretty basic. Meaning tons of roses, some leaves, more and more roses, and the random insert of clouds, rain, and stars. The nature theme is one that's been taken on a lot by platemakers so obviously its a bit tough to find new concepts within this theme. Fairytale lover plate - the patterns of which, in my opinion, have little or nothing to do with fairytales at all. Rather these are a bunch of abstract patterns and filigree which again aren't all that novel. This plate is what I would term as nice. You know I love abstracts, but I'm not blown away here. The Geo Lover plate. Is this Pueen's way of saying - we wanted to make an optical illusions plate but didn't want to use any of those names? I see images here from the Illusion Collection by MYL, images I have on my FUN plates, the radiating star from one of my UberChic Beauty Plates, oh and the lined star image from my Betina plates. Eep! And the Fancy Lover plate. You may recall in the Celebration Collection that Pueen already made giant version of a lace themed plate. So to me it seems like they made another lace plate thought its not a giant one like the last one. What's new? This one is rectangular and the images are somewhat different though not altogether novel. If your eye is sharp you will see some dupes from the MYL Kaleidoscope Collection and the Explorer Collection. I've also seen that lace pattern in the upper right hand corner on one of the new Marianne Nails plates. Still if you don't have any of the aforementioned plates of all the plates in Pueen's new collection I like this one the most.